Kochi, Kerala, India: Recognizing a company as the prestigious organization is the reflection of stupendous diligence of the entire team. As one of the largest financial market in the world, foreign exchange business has caught a momentous pace with innovations and improvements to enrich the lives of the people and create trust among the customers. Implementing currency buyback option as an excellent remedy for leftover currency brought a hike in foreign exchange services paving the way for the documented honor of SKOCH-Order-of-Merit Award. 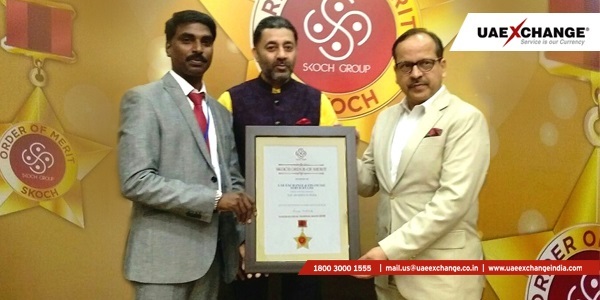 The most prestigious award was announced after the detailed evaluation and scrupulous selection process by the award committee and UAE Exchange India grabbed the esteemed SKOCH Order-of-Merit Award 2018 for adopting innovations in Foreign Exchange services. The esteemed function was held at Rafi Marg, New Delhi on March 10th 2018. Mr. Ramesh R, Head of Forex Department, UAE Exchange India received the award. UAE Exchange India always takes an extra mile to provide significant contribution with updated facilities. Digitalized services is the need of the day and it catalyses an avenue for novel services mainly in online currency exchange solution thru buyback options. UAE Exchange India is a name known for penchant quality and optimized financial service trends that stand ahead from the race of the industry. With an extensive reach of 375 plus branches, serving a population of 1.25 million people under the proficient support of 3500 employees, company facilitates both online and offline services as a paragon of excellence. The company has been instrumental in providing excellent service in Foreign Exchange, Money Transfer, Air Ticketing & Tours, Loans & XPay Cash Wallet. UAE Exchange India grabbed the esteemed SKOCH Order-of-Merit Award 2018 for adopting innovations in Foreign Exchange services.